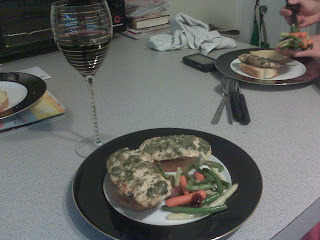 And in keeping with the wine theme from yesterday, my roomie made me a home-cooked meal the other night. Check out our matching plates and wine glasses, keeping it classy, working or not working. haha looks good. when are you going to start cooking meals like that?